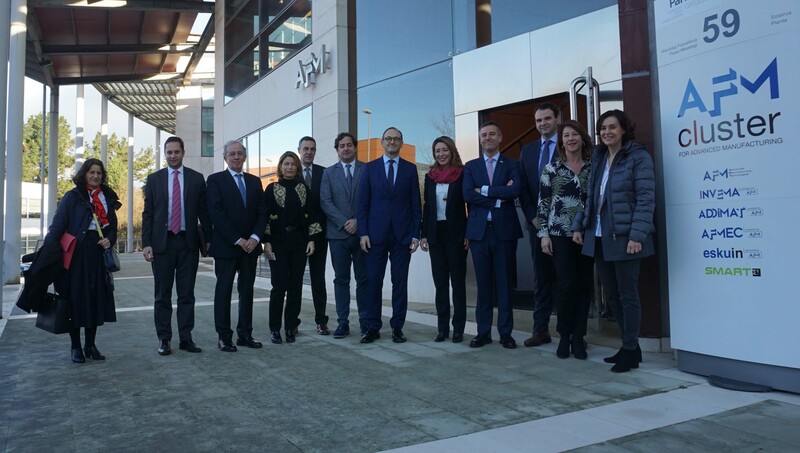 The Secretary of State for Trade, Ms. Xiana Méndez, visited the AFM Headquarters in San Sebastian this morning, where she had the opportunity to get a close-up look at the sector’s status and the challenges faced by the third largest machine-tool manufacturer in the European Union. The Secretary of State for Trade of the Ministry of Industry, Trade and Tourism, met with the Chairman of AFM Cluster, César Garbalena and General Manager, Xabier Ortueta, alongside Mr. José María Balzategui, Director of Fagor Arrasate and Rafael Idígoras, General Manager of Soraluce, who shared with her their impressions about the progress being made in their different markets, and the future prospects for their respective businesses. Xiana Méndez was accompanied by the sub-delegate of the Government in Gipuzkoa, Guillermo Echenique, and the Provincial Director of Trade and ICEX (Spanish Institute for Foreign Trade) in San Sebastian, Ana González de la Presa. Provisional figures are showing a slight rise in turnover on the machine-tool and advanced manufacturing technologies sector in 2018, by 2.4%. Despite fluctuations during the year, overall data indicates that the growth is driven by metal cutting, which is up by 6%. Metal forming, however, dropped slightly, by 4.7%. The other subsectors, components (+5%), tools (+3.2%), accessories (+2.3%), other machines (+1%), and machining (+13%), have improved with respect to 2017. The figure for incoming orders is also positive, up 3.5% on the figure for 2017.